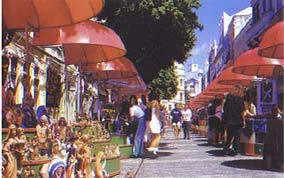 Recife, with its population of 1,800,000 is Brazil's fourth largest city. It is located on the Atlantic "Golden Coast" of northeastern Brazil and like so many cities with canals, is often called the "Venice of Brazil". Recife has three main regions spread out over islands and peninsulas connected by bridges. Like many other Brazilian ports, the beaches are excellent and visitors can choose among a wide variety - from crowded and colorful to desolate and deserted. This region of Brazil is steeped in full of Dutch history, as these European colonists settled here during the seventeenth century. Much of the attraction to Recife revolves around its cultural riches, since many buildings, monuments and museums reflect this significant era. Not far from Recife is the well-preserved colonial town of Olinda. Its many churches, convents and monasteries offer insight to life in the sixteenth and seventeenth centuries when this town was a colonial capital. In addition to these regular excursions from Recife, we also offer a series of special Interest Tours in the state of Pernambuco.